With winter behind us, you are probably dreaming about your summer vacation—perhaps a trip to a sunny beach resort, a National park, or historic city. Most of the men & women we serve at Fellowship Place have never taken an overnight trip outside of the city, let alone an activity-filled vacation in the country fresh air, but you can change all that with a donation to Fellowship Place via The Great Give® event. This year all donations made to Fellowship Place through The Great Give® 36-hour giving drive will be earmarked for the Birgitta Johnson Campership Fund, which awards annual camp scholarships for Fellowship Place members to experience four days in the country at an adult retreat and vacation center operated by the Salvation Army in eastern Connecticut, Camp CONNRI. Camp CONNRI is located on over 200 acres overlooking a lake surrounded by trees and open space. Activities include boating, swimming, arts & crafts, shuffleboard, archery, and dances. Making a donation to Fellowship Place through The Great Give is easy. 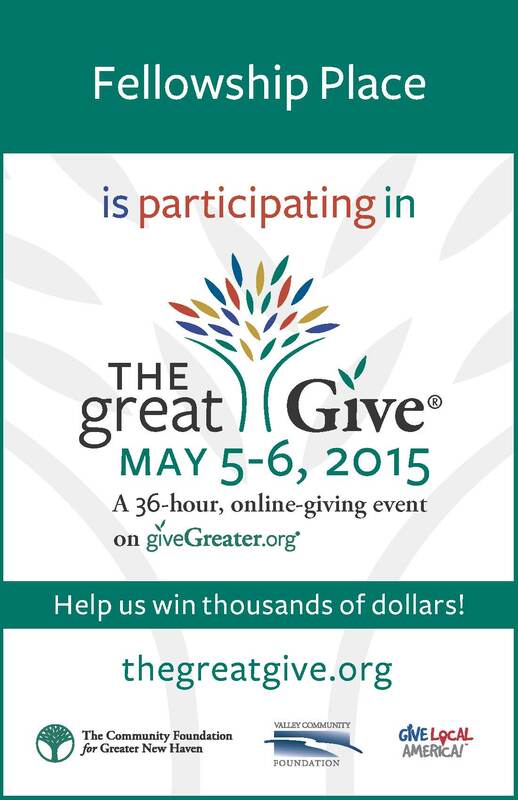 Visit http://www.giveGreater.org/ or http://www.TheGreatGive.org anytime between May 5, 2015, 8 a.m. and May 6, 8 p.m., and search for Fellowship Place and click “Donate Now.” Your gift will provide Fellowship members; low-income adults with mental illness from the inner city, a welcome break from city life. Special thanks for your interest and support of Fellowship Place’s work with adults who have a mental illness.